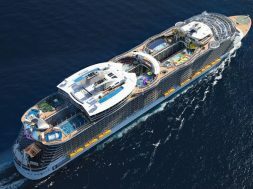 (Nov. 10, 2016) — The Caribbean is all primed to roll out a grand welcome for the world’s largest cruise ship, Royal Caribbean’s 226,963-ton Harmony of The Seas. Amid much fanfare, which featured a stunning display of 16 jet board and jetpack riders who performed an exciting stunt show, Harmony set sail late Saturday for a three-night preview cruise for travel agents and members of the media. Starting next week, the luxury vessel, which has a capacity of 6,780 excluding crew, will operate a permanent schedule of voyages out of Port Everglades to the Caribbean. 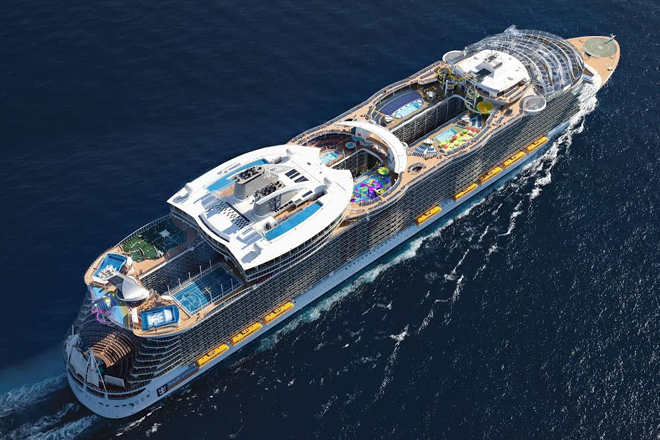 The three Royal Caribbean oasis-class ships met mid-ocean, for the first and possibly only time, on the eve of Harmony of the Seas’ debut in US waters. A major eye catcher on Harmony of the Seas is the ultimate abyss, a dramatic 10-storey-tall slide from near the top of the vessel, down to one of its lowest decks. An official christening ceremony was held on Thursday.